Counselling Camp at JNV Ratibad,Bhopal Region preferable to smoothen Transfer matters. AINVSA opines that the NVS should direct the employee to bring the hard copy generated after counting the Transfer Counts countersigned by the JNV Prinicpal at one Centre Place. The persons should be called up, in separate rooms as per the Hiearchy, Priority Lists and Exemption allocated for that matter by NVS in the recent Transfer Circulars of Headquarter . This would ease the matter as Spot vacancies would be created due to materialisation of Request Transfers on priority base. The coveted vacancy should be filled as per the Transfer Counts or Priority allocated for the same, by checking the Employee data in the software. In other words,the Software soft copy should be available at the Counselling Camp so that the Transfer Counts could be verified on the spot, for that matter, and the new vacany created by the employee getting Transfers should also be filled up, giving the same priority. There has been opinions from the Deemed vacancy listed employees, as well, that Counselling camp should be done , later for them also, and a chance to be given to those vacant places created on account of request transfers materialised, and all category prior to them given their desired place. Vote your opinions on the right side of this blog. This is to declare that the JNVs or the Alumnae approaching the MPs and other dignitaries should maintain the necessary protocols and decorum as required . The wordings of the letters , the salutations and office protocols, etiquettes should be sustained. Kindly refer Point No 21 of http://nvshq.org/display_current_news.php and adhere to the instructions therein. AINVSA, or this blogger, or for that matter any office bearer of AINVSA other than the defaulter would not be in anyway accountable for any contravention thereof. The hyper link for the Proforma to be handed over to the MP for pension ,mutatis mutandis, to be written by him is as below. But the covering letter should be written by the Alumni, and the JNV employees, Principal or the Unit Secretary of AINVSA should only accompany the Alumni. Let the Alumni take the lead this time to approach the statesmen, take political succour or persuading the MPs to write to the concerned Cabinet Ministers or P.M,FM,HRD Ministers etc . AINVSA only to take the backseat. And now AINVSA should also take pains in allotment of Transfers and the reasons for not giving their choice place , if they deserved and were entitled for it.. Unless and until there is no genuine reasons, the transfer aspirants should get their first choice place. If the second or third place is allotted to them , if entitled for transfers, then the reasons for not them the first choice place should be clearly mentioned against their data column of the Tentative list when declared. Kindly arrange an appointment with the MP, along with the Alumni and Staff of your Jnv., convince and persuade him to raise this issue in the next session of the Parliament. The enclosed leter-proforma is to be typed on the letter head of the Member of Parliament, by the MP. Some of the Vidyalayas have already begun this movement along with the alumni on ALUMNI MEET….. Your cooperation is highly solicited to initiate this venture to keep our Struggle for Old Pension GOI 1972 Scheme in continuity ….for the benefit of all Navodaya staff. AINVSA 's letter to modify in priority, from (d) to (c) the Spouse Category. AINVSA dreams that NVS would release the list of Annual Request Transfers 2016 in proper hieararchy and in the order of priority . The Transfer list of (a) should be released and then b) etc which has been given exemption from Transfer Counts/ completing Normal tenure, for that matter, ibid . Nevertheless, the Special Bonds of 3 years should not be at par with those who have worked for Special Bond of 10 years. Similarly ,working in hard station for simpy 03 years should not make them entitle to supersede those of the above clause (d) of Spouse Category which has been given sympathetic consideration by DOPT AND UOI Govt. Circulars from time to time .Hence , the priority and hierarchy interse should be analysed with just discretion to the satisfaction of all concerned. It will be just a façade to materialise in future days, created by putting the Spouse Category below Special bond category; if the priority is not interchanged between clause© and clause(d) of Para 2.2 . The employees under Category of Clauses (a),(b) and (d) are less compared to that of (c) . Consequent upon this, all the three category on sympathetic grounds and UOI Govt /DOPT circulars to that effect, namely (a)Differently disabled, (b)suffering from serious ailment/disease and (d) Spouse Category should be above in hierarchy of the (c) Special Bond Category or the Hard and Difficult Stations Category. particular and Govt in general. 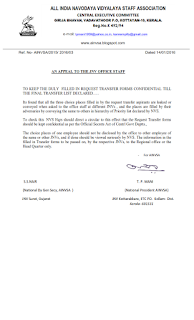 Transfer of Special Recruitment drive employees of 10 years Bond or that of the employees on Special Bond of 03 years would not leave any conducive or coveted place for the Spouses., Medical ground or the Differently Disabled employees aspiring Transfers., if the Transer list of the former is released prior to that of the latter categories. The Priority decided upon by NVS calls upon reconsideration and AINVSA would be highly obliged for this favour and sympathetic reconsideration. AINVSA gives an applause and a pat on the back of the Organisation NVS for the inclusion of Para 2.2 of NVS Hqrs circular dated December 22,2015 addressed to the Deputy Commissioners of all Regional Offices.,exempting the much suffered class of employees namely : a) Differently disabled b) Medical cases c) Employees working under Special Bond and d) Spouse employees waiting for unification , from TRANSFER COUNTS with reasons. It suggests NVS to release the list of Annual Request Transfers 2016 in proper hieararchy and in the order of priority . The Transfer list of (a) should be released and then b) etc which has been given exemption from Transfer Counts/ completing Normal tenure for that matter. Nevertheless, the Special Bonds of 3 years should not be at par with those who have worked for Special Bond of 10 years. Similarly ,working in hard station for simpy 03 years should not make them entitle to supersede those of the above clause (d) of Spouse Category .Hence , the priority and hierarchy interse should be analysed and with just discretion to the satisfaction of all concerned. There is good and sufficient reasons to modify the clause c) and d) of Para 2.2 as under , shared by some of the staff., and interchanging or enhancing Spouse Category from Clause d) to c) in the said Circular… modifying the Priority among the four ‘exempted from Transfer Counts’ category in the interest of the organisation. Special Recruitment drive employees of Special bond on completion of 3 years or 10 years would not leave any conducive or coveted place for the Spouses. The employees under Category of Clauses (a),(b) and (d) are less compared to that of (c) . Consequent upon this all the three category of (a)Differently disabled, (b)suffering from serious ailment/disease and(d) Spouse Category should be above in hierarchy of the (c) Special Bond Category. NVS vengeance towards Court or CAT Spouse Cases is visible in putting Spouse Category as d) instead of Clause c) in the said Para 2.2 ; repercussions of such injustices to the Spouses awaiting Unfication is not at all in the larger interest of the Organisation. NVS is only under Obligation to give Special Bond Category Transfers but not necessarily contravening DOPT Circulars as such. The Priority decided upon by NVS calls upon reconsideration and the SPOUSES instead dropping out of JNVs would be checked, and under the obligation of NVS on the other hand for this favour and sympathetic reconsideration.